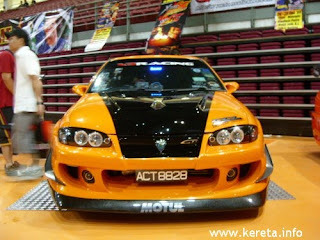 This is some photos showing Proton Satria with customized body kits. However, the front part of Proton Satria looked exactly like Proton Wira, thus making all the modifications almost the same ( I guess this is the standard of Malaysian-made car....always change the back, or change the front so that they looked a little different,and they sell again e.g Proton Arena..). 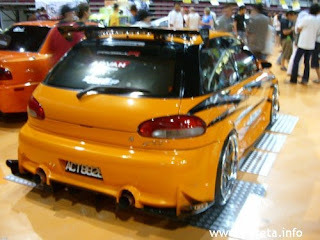 Glossy orange Satria, with front part similar to my previous posted Proton Wira body kits. White Proton Satria, with double super-size exhaust. This is another photo showing Proton Arena with cool custom-mixed gold-green colour, and who say pick-up or 4-wheeler cannot have extreme body kits? 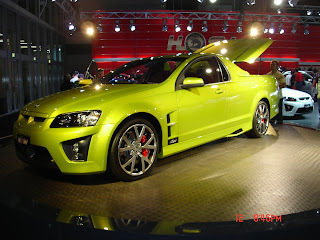 Nice pics but that green car is NOT an Arena, its a Holden Commodore ute, there's thousands of them in Australia. that not arena lah bro..
well that arena pic look like holden car..it is exactly the same.. Sorry wrong photo inserted, update done. Thanks for reminding.